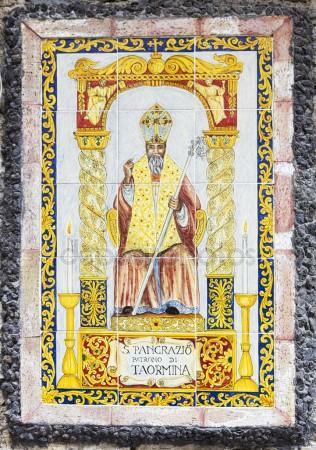 Saint Pancratius, Bishop of Taormina, was born when our Lord Jesus Christ yet lived upon the earth. The parents of Pancratius were natives of Antioch. Hearing about the good news of Jesus Christ, the father of Pancratius took his young son with him and set off to Jerusalem, in order to see for himself personally the great Teacher. The miracles astonished him, and when he heard the Divine teaching, he then believed in Christ as the Son of God. He became close with the disciples of the Lord, especially with the holy Apostle Peter. And it was during this period that young Pancratius got to know the holy Apostle Peter. After the Ascension of the Saviour one of the Apostles came to Antioch and baptised the parents of Pancratius together with all their household. When the parents of Pancratius died, he left behind his inherited possessions and went to a Pontine mountain and began to live in a cave, passing his days in prayer and deep spiritual contemplation. The holy Apostle Peter, one time passing through these parts, made a visit to Pancratius at Pontus, and took him along to Antioch, and then to Cilicia, where the holy Apostle Paul then was. And there the holy Apostles Peter and Paul ordained Saint Pancratius as bishop of the Sicilian city of Taormina. Saint Pancratius toiled zealously for the Christian enlightenment of the people. Over the course of a single month he built a church, where he celebrated divine services. The number of believers quickly grew, and soon almost all the people of Taormina and the surrounding cities accepted the Christian faith. Saint Pancratius governed his flock peacefully for many years. But one time pagans connived against the saint, and seizing an appropriate moment, they fell upon him and stoned him. Thus did Saint Pancratius end his life as a martyr. The relics of the saint rest in the church named for him, at Rome.